I love to have different seasonal wreaths for my front door. Of course the outside of my front door is not safe from the elements, so I just hang them on the inside of my front door. I am working on putting together a different wreath for each month of the year. 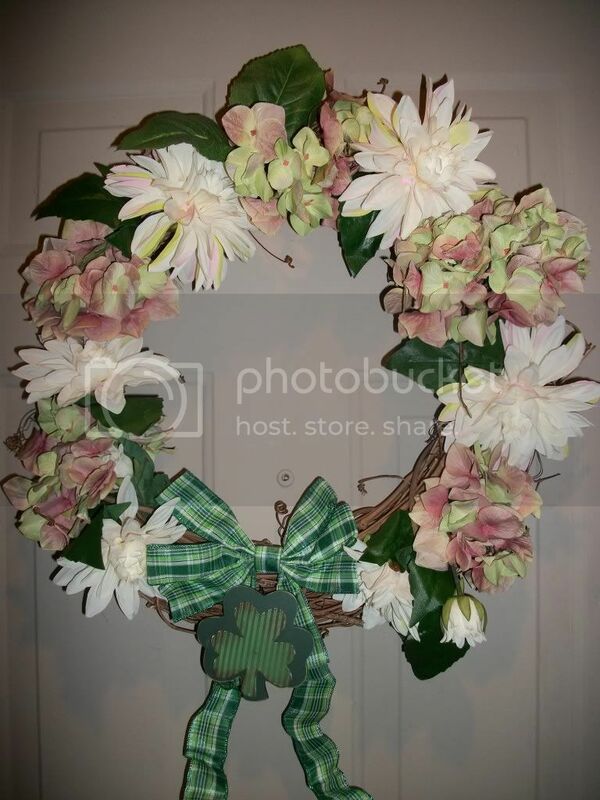 Below is my wreath for March which is a St Patrick's Day themed wreath. I started off with an inexpensive grape-vine wreath. This one I got at Walmart for under $5. I just switch out the different decorations for each month and store them in zip-lock storage bags. I then went to the craft store and bought 2 boquets of flowers (whatever variety you like). I cut them off of the bunches and left about 2-3 inches of the stems still on the flowers. I then placed them in the grape-vine wreath (weaving the steams into the wreath), and then attached a pre-made bow from the craft store and a little 4-leaf clover ornament also found at the craft store. I'll try and share my new wreaths each month as I make them. I had a really cute one for Valentine's Day, but I'll have to share that one next year.